On my recent visit to site (aka Rhyd Ddu station), I inspected the changes that had been written but not really shown in pictures on the various WHR websites. and then across a new foot crossing and onto the platform. Here a shot of Rhyd Ddu for comparison – you can see the white van parked on what was rough ground… This would need a new tarmac surafce, kerbs, the extra foot crossing, more gates, the shelter etc. adding and of course I’d have to leave the tamper shed out too. Thus it has been decided to freeze the layout at 2010. Now I might bend this somewhat to allow for other locos and stock to appear (e.g. the other NGG16 kit I have in stock) but this is generally the rule – 2010 it is. Yesterday further progress was made on the extension. 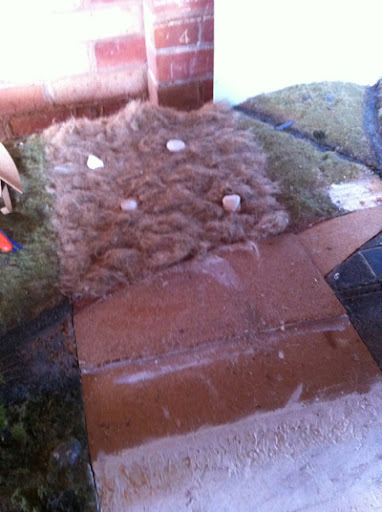 The modroc was painted brown and once dry covered in thick PVA and clumps of hairy underlay were added. Once dry they will be trimmed back and then painted with the usual LNER Doncaster green. A couple of random rocks were added from my box of spare pieces, these will be coloured too of course. The hidden sidings board has also been cleared of track, rubbed down, bleached and now painted black to protect it from the damp induced mould it suffered this winter. Well here are the promised pictures of our ‘Lady in red’ aka WHR Beyer-Garratt NGG16 No. 138. - Completely different arrangement of boiler fittings including safety valves on a small plinth. There remains some additional small bore pipework to add. - Oil tank in bunker with vent, the top of which was made from a wheel bearing! - Extra tank side rivets created with small wire poked into small holes. The kit has a SAR pattern rivetted version of the tank/bunker and all those rivets were filed off to represent the welded tanks. - Markits wakefield lubricators (heavily modified) added to the running plates (not shown below), vac pipes different pattern to standard SAR. and the beast has been finished with etching primer, then 2 coats of Railmatch EARLY BR(M) crimson lake, lined in straw (acrylic) using a bowpen and size 0 sable brush, Floquil 'engine black' added to corners and tank backs etc. Finally, 2 coats of Precision Paints Satin Varnish was applied to boiler/firebox and cab only. Smokebox area painted with Humbrol 'gunmetal' enamel and left unvarnished. Following my trip on the final bit of the WHR recently, I have updated my table of NG railway ratings and, by 1 point, there is a new leader (mainly as the line gains a cafe (at harbour) that it had not before). I had some wonderful images sent me last night from Dad showing 138's body lined out. I'll post some shots here asap and explain some of the changes made to the base kit to accommodate the WHR changes to the SAR design - there are quite a few!